Colour party of King’s African Rifles. 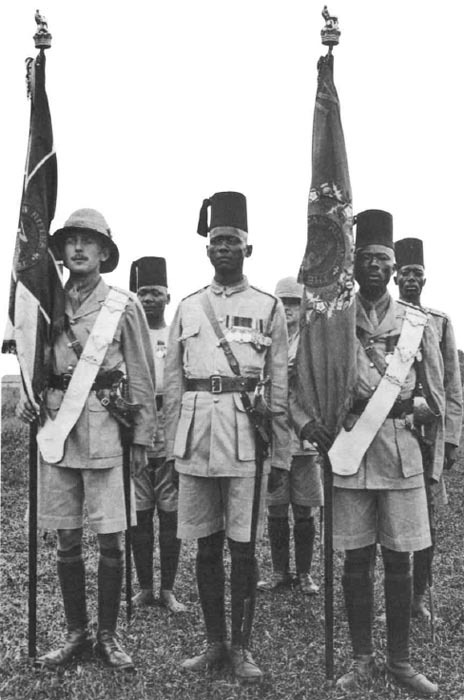 East Africa: 1/2nd KAR defeat c.76 Germans in Kilwa, push to Fort Kibata (seized October 14). Transylvania – First Battle of Oituz (until October 27): Rumanian Fourth Army (Prezan) eventually halts Arz’s Austro-Germans on border (until October 22). Greece – Greek Fleet disarmed: 2 battleships and armoured cruiser Averatt stripped of shells and breech blocks, crews reduced to 1/3. Allies tow cruiser Helle, 19 destroyers and torpedo boats, 2 submarines and 12 auxiliaries to Keratsini. French hoist tricolour on them and occupy Salamis Arsenal (November 7). North Sea: Norway prohibits belligerent submarines from using her territorial waters. (Ban extended to all foreign submarines on February 1, 1917).